Our thanks go out again to paddy who this time gives us a small piece of the CITIZEN K ESPANA article, translated to English. CK: What did Viggo Mortensen provide the film? ADY: Everything; absolutely everything. In Spain, because of the tradition of our cinema, we don't have action heroes, and Viggo combines an impressive physique (that "exact image of the weary hero" that Arturo wanted) with the fact of being a spectacular actor of action (films). He's an extraordinary actor in dialogues, in everything...he has that combination that it's so difficult to find here. Viggo has been the vital centre of the film. The title of the movie is "Alatriste"!!. His experience, his help and his advice have also been very important. CK: And with the consent of Victoria Abril and Penélope Cruz, what's the difference in working with the big stars of international productions? ADY: None, although Viggo represents that "other Hollywood". Some people I know who have worked with some big stars haven't spoken well of them at all, but I have to admit that, although at first I was a bit worried, it's very easy to work with him. Generally, until you start to shoot, everybody is very polite and very friendly. 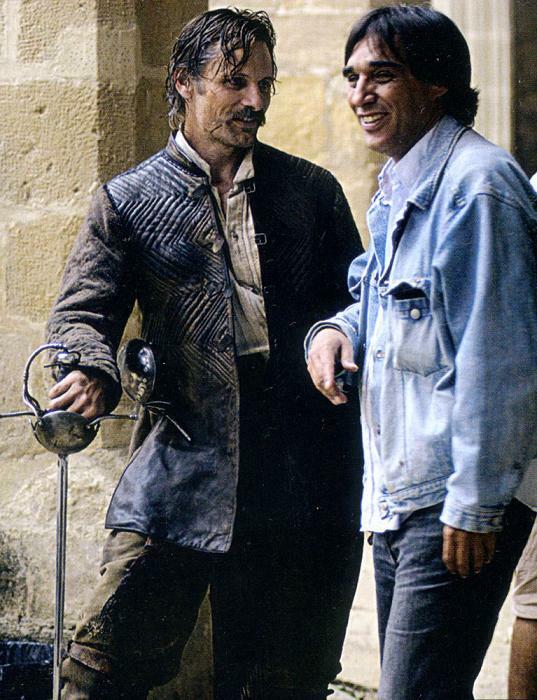 But Viggo is very nice before, during and after shooting. It's almost impossible to think of him as a Hollywood star, even though he is. He's meticulous, very professional, and he has that knowledge of cinema "from the inside", a bit like Victoria Abril. Besides being actors they are scripts, editors, photographers...they know all that, indeed. © CITIZEN K ESPANA (VERANO, 2006). 2006 CITIZEN K ESPANA. All Rights Reserved. BY: Andres Rubin de Celis. 2006 Estudios Picasso/ Origen PC. All Rights Reserved. Images © Kika Palacio. We must extend appreciation all around for this collaborative effort. 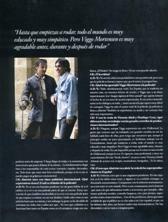 First our thanks to Romarie from el Alma de Viggo, for the scans of this latest article and interview in Acción Magazine. Next we have to thank our wonderful paddy for the translation of the interview. Click on scans to enlarge. There are not too many stars who can boast of having "put a peak in Flanders" (tr. note: the accurate translation would be "having brought off a coup", but needed to leave the literal translation for the next sentences to make sense). 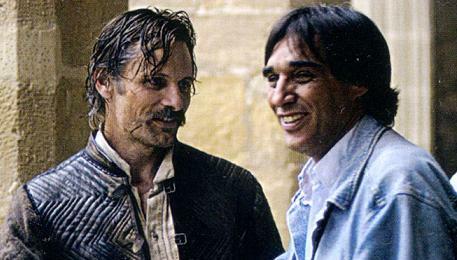 But the American Viggo Mortensen (New York, 1958 )is one of the few who has the opportunity to boast of having fought around there at the command of Felipe IV of Spain (The Planet King). In the fiction, the American performer has recently captained one of the Tercios that, for centuries, plagued with nightmares the sleep of the Dutch and the Belgians. However, sitting comfortably on the soft sofa that bears his 1'80 m spread, he doesn't look like he had fought hard in many dark alleys. With polite manners and calm expressions, the ranger Aragorn from "The Fellowship of the Ring" chats with ease, no matter which subject is being discussed, while he drinks a strange greenish liquid similar to the herb tea. Faithful to this constant politeness, Mortensen doesn't hesitate when it comes to choose the language of the interview ("in Spanish, please"), an understandable deference coming from a man who loves languages since his most tender age (apart from Spanish he speaks fluent Danish, Norwegian and Swedish). All the time on the alert, the heroic performer listens attentively and answers almost in a monotone, never disturbing the peace of the small lounge where he receives the journalists, commanding a verbal duel in which there's no victory or defeat. -"The Lord of the Rings", "Hidalgo", "Alatriste"...Do you feel comfortable in the field of swashbuckling films? It can be a comedy or an adventure film. The genre doesn't matter to me, as long as I play an ideal character that transmit me something. However, I think that "Alatriste" doesn't narrate exactly a simple adventure story; and the viewer who want to see it as something that just entertains will find he was wrong. I think it's a lot more. In my opinion, it's a beautiful piece of cinema d'auteur. It's a sincerely artistic, complicated and very interesting film. I think that the miracle that surrounds the film is that it honours the Spanish history and those who were soldiers - the "bravos" of the Golden Century - , the culture, the art, the painters, all that. But it does that by transmitting the truth : it doesn't say that Spain was beautiful, grand, good and admirable; on the contrary, it's a rather honest and complex story. -Your role in the film is that of a solitary soldier, who finds hard to live as a civilian. What's your perception on Captain Don Diego? As any single man of certain age, I think that people get used to do things their way. He's a man who hardly ever is at home, let's say, he's always at war; that's why he shows the characteristics of any soldier who has a long professional life. It's a bit difficult for him to open up to feelings and he's vulnerable, and he finds in María de Castro the perfect partner, because she also has a hard life and it's difficult for her to be more communicative. It's not always easy for them to talk clearly about what they feel; although it's beautiful to see that union. Personally I liked that relationship very much. Ariadna Gil plays a very good role and she also looks gorgeous in the film. To tell the truth, having to describe her as the most desired woman in Spain during a scene in the bed wasn't difficult at all, it was very easy (he smiles complicitely). I think that she and the rest of the actors have done their work very well, and Ariadna was never seen like this. -While the texts that this film is adapting are widely known in the Hispanic world, in the United States they haven't had such repercussion. 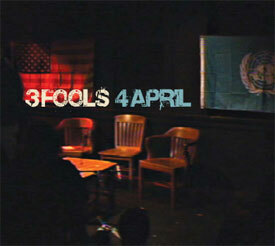 Assuming that fact, how did the opportunity to take part in this production fall into your hands? I didn't know Arturo Pérez-Reverte's novels. Long ago, I had worked in Spain with Ray Loriga, in "My Brother's Gun". One day, Ray told me he was going to be in Berlin, where I was promoting "The Return of the King", by Peter Jackson. Loriga went with a friend, Tano (Agustín Díaz Yanes), who brought a script that he gave me to read. I liked the plot as a tale, as a story. And it captivated me. So I decided to do it, against everyone and against everything. -After (living) your childhood between Venezuela and Argentina, you learnt to speak fluent Spanish. But it's quite different to face the language used in the XVII century. Did you need to make too much an effort to assimilate the expressions of that time? Yes, the pronunciation was quite difficult for me. Getting used to the way people speak here wasn't so difficult, but what took me a little more time to do well enough to play the role was acquiring the rhythm of speech. In order to get that, I remember it was helpful to find a place where I could do a research, something I use to do with all the characters I play. I started to study how Don Diego was like, how he was born, how his family was, the village, the country...And while doing this task I knew, through the Alatriste books, that he was from the Old Castile. So I spent my time travelling the place before shooting. This way, I could imagine how the protagonist behaved and spoke, and it also helped me to understand why he is so concise and careful with his friends. I was mainly in the area of León, where I interviewed several people. In order to complete the information I asked Pérez-Reverte, and at the same time I analyzed two biographies about Captain Alonso Contreras that gave me some clues about my work of characterization, although he was a person who talked a lot more than Alatriste. This exercise taught me that the life of a soldier was very interesting in the XVII century. Now that I'm recalling it, I have to say that I felt quite comfortable in the North of Spain, especially in the mountains of León. -Do you think that the plot of the film is valid at the present days? Yes. That's how it's usually done in theatre; for example, it would be like adapting Hamlet in Madrid, in the year 1955 and during the time of Franco. If the story would be happening now, this same script by Tano would be set in the XXI century; and it would be taken under the American perspective. I think that Alatriste would be a kind of a Special Forces sergeant, a veteran who would have fought in the first war of Iraq or in Panamá in the 80's. However, he would probably have, more or less, the same opinion as the role of the XVII century. The reasons that cause a war haven't changed too much. It's like what Olivares says about the importance of Flanders for Spain and for the truce. This same thought serves both the Flanders of the past and the present Iraq. Yes, it's interesting; although not only the American Westerns, but it's also influenced by the Argentinians, with their concept of the "gauchesco" (related to the gauchos). The gauchos, with their love for horses and the mixture of Native, Spanish and European blood, are very much alike the characters of "Alatriste". But while researching about the subject, I also realized who the "bravos" of Spain really were. The gauchos' way of speaking, behaving and walking is very similar to the bravos' of the XVI and XVII centuries; that influence is intensely noticeable. At the moment of shooting I applied those things they have in common, especially the way of moving the cape while fighting, quite related to the use of the poncho. An example of this kind of man, well known in Argentina, would be Martín Fierro, who is very similar to the protagonist of Agustín's film; both of them are heroes but not completely good, sometimes they are wrong and make mistakes. Yes, I'm glad it can be noticeable, although I don't exaggerate it too much on the screen. Tano is the son of a bullfighter and he's very fond of bullfighting; and, before shooting, I was paid a visit by some professionals of this discipline. I think that, in a way, what is left of the bravos of the Golden Century lies in bullfighters, more than anything because of their attitude towards death and towards weapons. I thought there was something there, and Tano encouraged me to follow that intuition. This has nothing to do with what I think about bullfighting. simply, these contacts made easier for me to be closer to the kind of man the film describes. It helped me a lot to delve into that world, full of honest and proud people (he smiles briefly). To a certain extent, I can say that "Alatriste" is also a homage to bullfighters. -Among your likings we can find painting and photography. Could you do an aesthetic evaluation of the film? They were very careful of the light. There's a lot of Velázquez. I loved that the film was dark in many of its scenes, because in that time there wasn't electric light; and the crew showed very well what that time was like, difficult and gloomy. When I saw the result for the first time i thought: "This is like what I dream of". It's similar to such sensations as that of going back the Ancient Rome, for a couple hours or one day, invisible, to be a witness of all that. If one could return to the Madrid of the Golden Century, I think it would be like this. Perhaps many things would slip our notice, like the political intrigues, but it would be very interesting. I think that, visually, Tano and the technicians have perfectly painted the time of Alatriste, caring for any detail regarding the camera direction, the characters, how the relationships among them are being told. All that is very well done, because it's subtle and obliges the audience to think. -You use to bring to life characters with all shades of grey, capable of the admiration and the reproach. What's necessary for you to be captivated by a project? I look for the contrasts that any person usually has in the real life. Nobody can simply be good or bad. I always find interesting to delve into what isn't written in the script. I like the guys like Alatriste, who express when they are frightened, although it may seem they have not such feeling. He's a man with lots of nuances. -There are rumours about your next collaboration - in "Eastern Promises"- with David Cronenberg, who you already worked with in "A History of Violence". Could you confirm or deny this information? Yes, in November I'll start to work with him, in England. 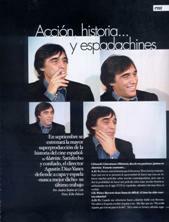 © Accion (July, 2006): 2006 Accion. All Rights Reserved. TXT: Robert Gomez and Jesus Martin. Images © Paco Ferrero. Our thanks to Sachie for posting this article and interview from CITIZEN K ESPANA. Years ago I recognized my kinship with all living things, and I made up my mind that I was not one bit better than the meanest on the earth. I said then and I say now, that while there is a lower class, I am in it; while there is a criminal element, I am of it; while there is a soul in prison, I am not free. Freedom is not something that anybody can be given. Freedom is something people take, and people are as free as they want to be. It is possible to read the history of this country as one long struggle to extend the liberties established in our Constitution to everyone in America. For those who stubbornly seek freedom, there can be no more urgent task than to come to understand the mechanisms and practices of indoctrination. These are easy to perceive in the totalitarian societies, much less so in the system of 'brainwashing under freedom' to which we are subjected and which all too often we serve as willing or unwitting instruments. Storytellers and stories change, but the opportunity to do well or ill by others and ourselves will always be present. The right to choose how we coexist is ours unless we willingly surrender it. There can be no quick fix, no easy or permanent answer to the troubles of today or tomorrow. A sword is a sword, nothing more. Hope, compassion and wisdom born of experience are, for Middle-earth as for our world, the mightiest weapons at hand.